We can offer a wide selection of roller, tension and cassette banner systems, offering style and quality at affordable prices. With options like a quick change graphic slider or telescopic pole for adjustable heights, your only problem will be which one to choose. 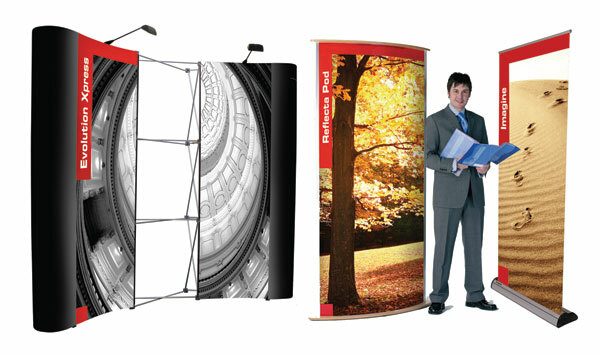 As with our pop-up systems, we use the latest technology to ensure you fast installation and easy graphic positioning. Made from quality anodised aluminium or with a powder coated finish, these systems are Ideal for all your exibition or promotional needs. 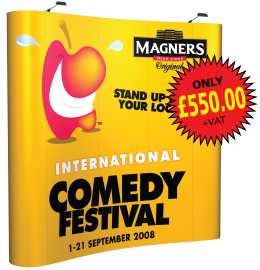 For an economy roller banner that looks that little bit different, Start is the ideal choice, Its unique rounded profile base and smart trim sets Start aside from standard economy banners, the graphic pulls up from the front of the base giving your message floor to rail visibility. A quality lightweight roller banner with a slim base and hybrid pole making it very compact, complete with a twais out foot for extra stability. A versatile banner that has been designed with simplicity of use in mind. Original 2 is manufactured in the UK, allowing us to offer it in a choice of six widths. The larger sizes offer a very cost-effective solution for wide-format graphic displays.